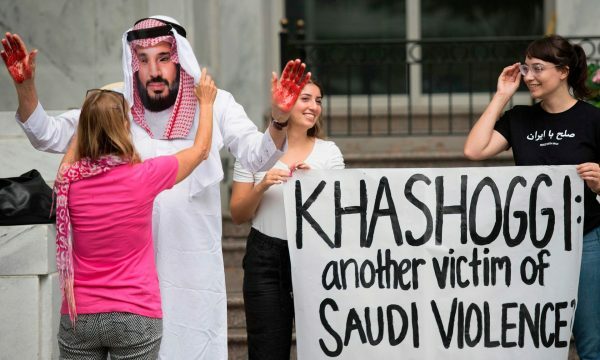 Above: Media Benjamin stands in front of a demonstrator with fake blood on their hands dressed as Mohammed bin Salman, the crown prince of Saudi Arabia, outside the Saudi embassy in Washington. Photograph: Jim Watson/AFP/Getty Images. Saudi Arabia has made headlines recently for the killing of journalist Jamal Khashoggi. What happened to Khashoggi is certainly tragic, but it’s far from the only crime committed by the Kingdom of Saudi Arabia. Despite its history of thuggery, the US has been cozy with the kingdom for decades. Here’s 10 reasons to sever this nefarious alliance with the Saudi kingdom. There is no political freedom in Saudi Arabia. While most of the world’s monarchies have evolved to lessen the role of royalty, Saudi Arabia remains one of the world’s last absolute monarchies.The Saud royal family picks the king, who then has ultimate authority in virtually every aspect of government. There are no national elections and political parties are banned, as are unions and most civic organizations. Mohammad bin Salman is falsely hailed as a progressive hero. Since becoming Crown Prince in 2015, Mohammad bin Salman has been credited with a number of reforms, such as granting women the right to drive (despite arresting the very women who advocated for that right). These highly publicized changes serve to distract the global community from bin Salman’s ruthless policies, such as escalating the war in Yemen, cracking down on human rights activists, and increasing the number of executions. The regime is one of the most misogynist, gender-segregated countries in the world. Saudi women famously gained the right to drive recently, but the kingdom maintains its oppressive male guardianship system where women must obtain a man’s permission before doing things like getting married or divorced or applying for a passport. Gender segregation persists as well: women are separated from men in public and even private places, like restaurants. Women’s rights advocates are frequently arrested for their activism. Free speech and free association are forbidden in the kingdom. There is no free speech or free press in Saudi Arabia, and criticizing the government or royal family is punishable by flogging, jail time, or even execution. Tragic examples include Samar Badawi and Nassima al-Sadah, two women’s rights activists who were arrested in 2018; Raif Badawi, Samar’s brother, who was sentenced to ten years in prison for blogging in favor of a more liberal society; and Ali al-Nimr, who was sentenced to death in 2014 for his participation in the 2012 Arab Spring protests and is still on death row today. Saudi Arabia has one of the highest execution rates in the world. At least 146 people were executed in 2017, mostly by the gruesome practice of beheading. The government does not have an official interpretation of Sharia law, meaning a judge can consider nearly any offence serious enough to warrant the death penalty. The death penalty has been meted out for “offenses” such as atheism, homosexuality, and sorcery. The Saudis export an extremist interpretation of Islam, Wahhabism, that has formed the ideological foundation of extremist groups around the globe. A Wikileaks-revealed 2009 cable quotes then-Secretary of State Hillary Clinton saying, “Donors in Saudi Arabia constitute the most significant source of funding to Sunni terrorist groups worldwide.” In Syria, the Saudis are supporting the most extreme sectarian forces. Together with the Emirates, Saudi Arabia has recruited al-Qaeda fighters in their war with Yemen. And we must not forget that 15 of the 19 hijackers who carried out the 9/11 attacks were Saudis, as was Osama bin Laden himself. Saudi Arabia helps maintain the world’s destructive dependence on oil. Saudi Arabia is the largest exporter of oil in the world. With its vast potential for solar energy, Saudi Arabia could lead the world in renewable energy. Instead, the economy remains almost dependent on oil and on the international level, Saudi Arabia works with the United States to oppose global climate agreements that would affect oil profits. They have engaged in a catastrophic war in Yemen. For over three years, Saudi Arabia has been at the forefront of the horrific war in Yemen. Thousands of civilians have been killed and three million have been displaced. A Saudi-run blockade have caused a famine that has killed over 50,000 children. The US is indirectly responsible for these crimes because it continues to sell arms to Saudi Arabia. On August 9, 2018, for example, a US-made bomb hit a school bus in Yemen, killing 40 children. By maintaining close ties with Saudi Arabia, the US is sending a message to citizens around the world that it values money and power over human rights. Now that Khashoggi’s gruesome death has opened people’s eyes to the murderous ways of the Saudi Crown Prince, it’s time to peel away the layers to expose the rot at the core of this repressive monarchy. Medea Benjamin is cofounder of the peace group CODEPINK and is author of Kingdom of the Unjust: Behind the US-Saudi Connection. Mary Miller is a CODEPINK researcher/analyst.